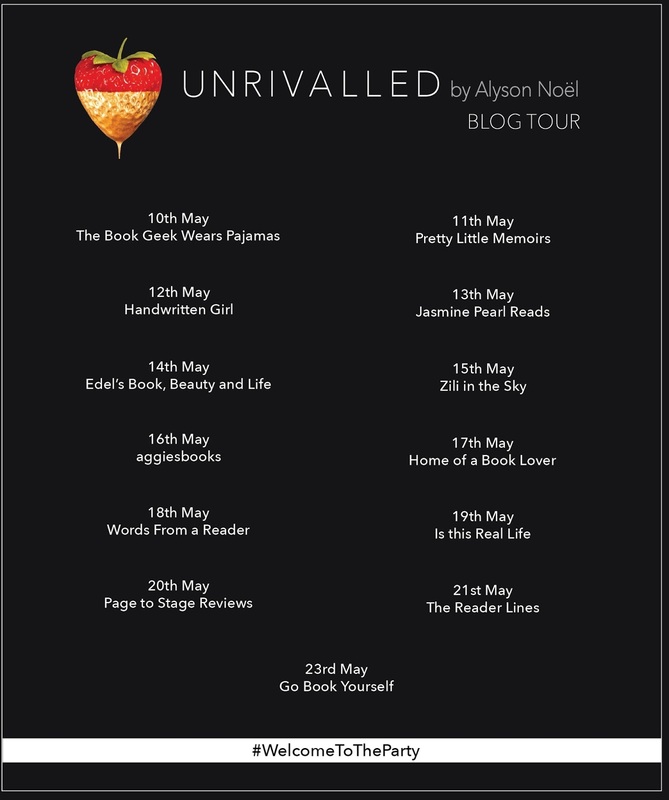 Welcome to the Unrivalled blog tour! 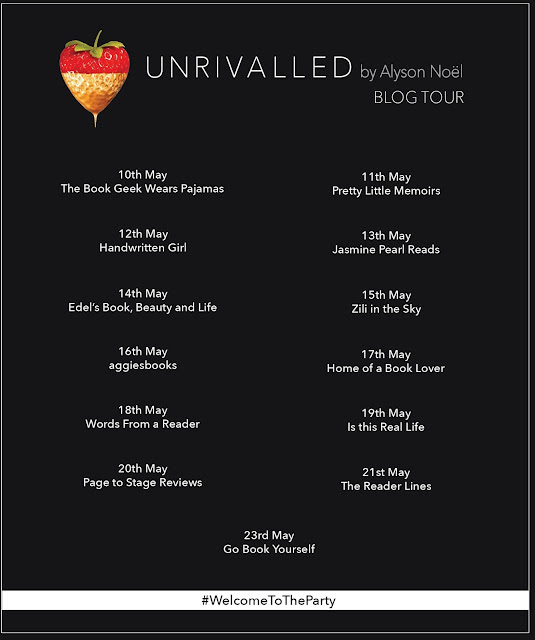 I'm the second stop on this chic, beautiful tour by the amazingly talented Alyson Noël! Today, I'll be featuring an excerpt from the novel along with my review of the first book in the Beautiful Idols series! Alyson's novels have always been around me, right from the start of my blog. I always see her novels in book stores and that proves just how popular she is. When I was offered the chance to read her new series that was similar to the likes of Gossip Girl and a sleek, chic VIP world of Hollywood, I jumped at the chance. I wanted to be #OnTheList for sure. Noël paints us a picture of a distorted Hollywood, peeling away the rose-tinted glasses we view it with and showing us the Los Angeles that Madison Brooks, Hollywood Starlet, knows. With a shock opener and a mystery clouded with questions, glamour and VIP nights, we're lead straight into the mist of a multitude of mysteries. Throughout Unrivalled, we follow four very different characters who along the timeline of the novel have varied motives, actions and personalities. There's Layla, who's the most likeable of the four. She runs a blog, which ultimately makes her more understandable to me, although with her dream of becoming famous, it's to be a reporter. Aster's character took some delving into to see beneath the surface of her true self. At the start, she seemed to be chasing fame at every chance she got, but when parts of her story and true self peak through, I liked her more and her struggle to step outside the family beliefs and tradition were very believable. The next character, Tommy, I had the most difficult time getting to know. His secret made him interesting, although not as intriguing as Layla and Aster. I can see his character development probably becoming more lengthily and compelling as the series continues. Then we have Madison, who is the focal point of Unrivalled. She is wise and knows what she's doing, and it's gotten her far in Hollywood. But when she goes missing quite soon into the novel, her disappearance isn't the only mystery that needs to be solved because all the characters have something mystifying about them that makes Unrivalled go from a mystery to a twisting cliffhanger that echoes the realness of the price to pay for fame and the consequences of the secrets we hide. Overall, Alyson has written the start of something so great. I found it addictive, like a reality show you can't stop watching. I totally get the comparison of Gossip Girl and Pretty Little Liars, where the book seems to step into the more challenging aspects of real life and how deceiving things can be outside of the TV screen. When the mystery got started and things picked up after the introduction of the characters, I was truly hooked and I read it in just over a day. If you love big city mysteries, mixed with charm, glamour and thrills, you'll love Unrivalled. I'm excited for the sequel for answers to questions that it leaves us with and it's already on my TBR. 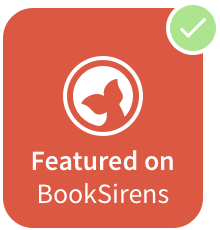 Five stars completely - YA mystery at it's best. YA mystery, drama and thrillers. Fans of Gossip Girl and Pretty Little Liars. Despite the crush of tourists storming the sidewalks year after year, Hollywood Boulevard is a place best viewed behind a pair of polarized lenses and lowered expectations. From the string of sagging buildings in various stages of decay, the tacky souvenir shops hawking plastics statues of Marilyn in her windblown white dress, and the seemingly endless parade of addicts, runaways, and glamour-deprived transients, it doesn't take long before the sunburned, white-sneaker-wearing masses realize the LA they're searching for does not exist there. In a city that feeds off youth and beauty, Hollywood Boulevard more closely resembles a former screen siren who's seen better days.The incessant sunshine is a harsh and brutal companion, intent on magnifying every wrinkle, every age spot. Yet for those who know where to look (and those fortunate enough to boast a spot on the guest list), it also serves as an oasis of the city's hottest nightclubs—a sort of hedonistic haven for the young, fabulous and rich. 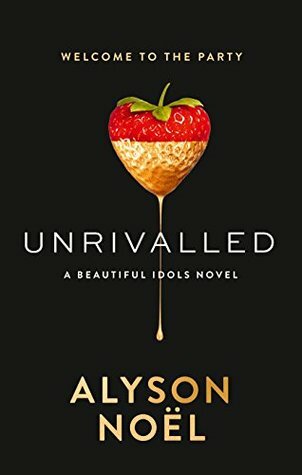 Have you heard of Unrivalled? Have you read it or added it to your TBR?